Besides the work carried out all year in the schools, JM also organize festivals this summer! On July 9th, the Jeunesses Musicales de Liège will present the second edition of the Wégimont Festival 2017, a young festival dedicated to music and families. In a setting of exceptional greenery, 15 km from Liège, come to discover with family (children from 3 years) this festival entirely oriented to young people, with many shows and animations. On July 16th, the Jeunesses Musicales de Namur invite you to the second edition of the Festival Haute Frequency! Like last year, this original musical event will revolve around concerts and musical entertainment for families. 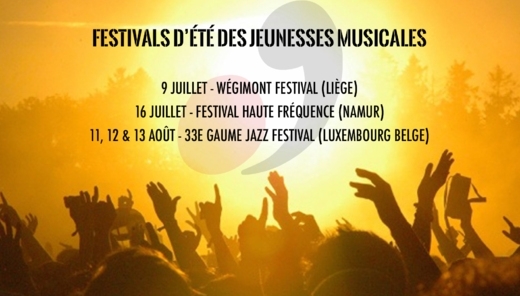 On August 11th, 12th and 13th, the Jeunesses Musicales du Luxembourg belge organize the 33rd edition of the Gaume Jazz Festival. Three days of celebration and intense moments to share alone, with family or friends in the bucolic park of Rossignol. 25 groups alternate on the 5 stages for an unparalleled multiplicity of flavours.